Donte' Raheem McFayden Jr. obituary. Carnes Funeral Home. Jan 23, 2018 Praying for the McFayden and Spells Family. 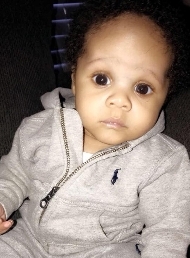 Donte’ Raheem McFayden Jr. “Deuce” passed away on Friday, January 12, 2018 in Texas City, Texas. He was born July 18, 2017 in Watertown, New York to Donte’ Raheem McFayden Sr. and Candace Spells. Survivors include his mother Candace Spells and father Donte’ Raheem McFayden Sr. sister Jaycelon Taylor, grandmother Terena Williams and grandfathers Ronnie McFaydem Sr and Wesley Spells Dr as well as a host of uncles, aunts and extended family. A visitation will be held on Wednesday, January 24, 218 at 1pm. The graveside service will be held at 2:30pm at Hayes Grace Memorial Park. 10708 Hwy6, Santa Fe, Texas 77510.